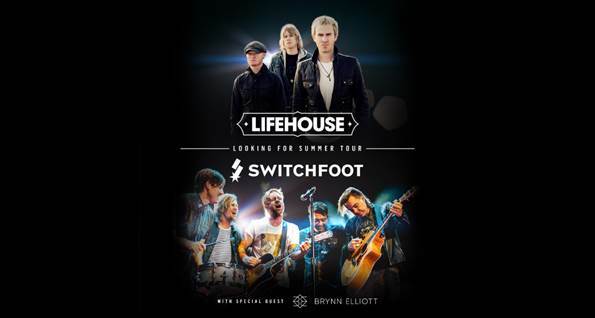 Rock fans across North America can look forward to Lifehouse & SWITCHFOOT together for the first time on the “Looking for Summer” Tour, delivering 30+ shows to venues across the U.S. and Canada. The tour kicks off July 23 at the Fillmore Auditorium in Denver and will run into the fall, culminating at The Masonic in San Francisco on September 10. Up-and-coming songstress Brynn Elliott will open every night of the tour. It was in 2001 when the Los Angeles-based Lifehouse first broke through in a big way when “Hanging by a Moment,” from No Name Face, spent 20 weeks in the Top Ten, and won a Billboard Music Award for “Hot 100 Single of the Year.” Since then, the band has released six more albums, three of which made the Billboard Top Ten, sold over 15 million records worldwide and spun off such hit singles as “You and Me”, “First Time”, “Whatever it Takes”, “Broken”, “Halfway Gone”, “Between the Raindrops” and “Hurricane.” Lifehouse’s 7th album, Out of the Wasteland, debuted at #1 on the independent album charts in 2015. SWITCHFOOT’s latest album, Where The Light Shines Through, released on July 8th, 2016 via Vanguard Records. Where The Light Shines Through is the band's tenth album and the first since 2014’s highly acclaimed Fading West. The album was self-produced in collaboration with John Fields, who helmed the multi-platinum breakthrough The Beautiful Letdown. Since their debut album No Name Face, released in 2001, Lifehouse has sold over 15 million records worldwide and played to sold-out shows around the globe throughout their 17-year career. Comprised of Jason Wade (lead vocals, guitar), Bryce Soderberg (bass, vocals) and Ricky Woolstenhulme Jr. (drums, percussion), Lifehouse is an American rock band like no other. With songs in the top 10 of Billboard’s Hot 100, Alternative, Adult Top 40, Mainstream Top 40, Adult Contemporary and Adult Pop charts, Lifehouse has proven their versatility and longevity. Their staying power is due in large part to Jason Wade’s signature voice and heartfelt songwriting talents, as well as his long-time partnership with co-writer, co-producer Jude Cole. Known for their infectious, upbeat hit songs “Hanging by a Moment”, “First Time”, “Halfway Gone” and “Hurricane” as well as the emotionally charged, ballads “You and Me”, “Broken” and “Whatever It Takes”, Lifehouse has spanned the radio dial for well over a decade. But Lifehouse won’t be pigeonholed as a radio band. High-energy rock performances and intimate acoustic moments are to be expected from a Lifehouse set. Having toured the world extensively, they have amassed a fiercely loyal fan base in the States, Europe, Australia, South East Asia and South America. For more information on Lifehouse, please visit www.lifehousemusic.com/. Formed in San Diego in 1996, SWITCHFOOT is Jon Foreman (vocals, guitar), Tim Foreman (bass), Jerome Fontamillas (keyboard, guitar), Drew Shirley (guitar), and Chad Butler (drums). Since their start, the band has sold over 5.7 million copies worldwide of their first nine studio albums (including their 2003 double-platinum breakthrough The Beautiful Letdown and 2009's Grammy Award-winning Hello Hurricane), racked up a string of Alternative radio hit singles, and performed sold-out world tours with over 4 million concert tickets worldwide. Beyond their career achievements, SWITCHFOOT has also been active in a variety of philanthropic efforts, raising over a million dollars to aid kids in their community through the band's own Bro-Am Foundation, providing services to underprivileged and disadvantaged youth. They've also maintained a deep commitment to a variety of humanitarian causes, lending their support to such worthy organizations as CURE International, DATA, the ONE Campaign, and Habitat for Humanity. For more information on SWITCHFOOT please visit http://switchfoot.com/. Ever Wonder How The Tony Awards Got Its' Name?